When Hurricane Florence hit New Bern, N.C., high water was the primary concern, with boats overwhelmed by the flooding. On Sept. 25, Ed Keelan, operations manager at Georgetown Landing Marina in Georgetown, S.C., was warily watching water levels. Nearly 10 days after Hurricane Florence had made landfall in New Bern, N.C., the storm was still making its presence felt. The marina is located where the Waccamaw, Pee Dee and Black rivers converge. All the water that the storm surge blew in combined with 30-plus inches of rain that fell. The previous water-level record had been 17.9 feet; the Waccamaw crested at 21.16 feet that evening, according to Bryan Blankenship, chief meteorologist at Emergency Alert, an emergency management service. “All we can do is hope that the water doesn’t get high enough to float the docks off the pilings,” Keelan said. 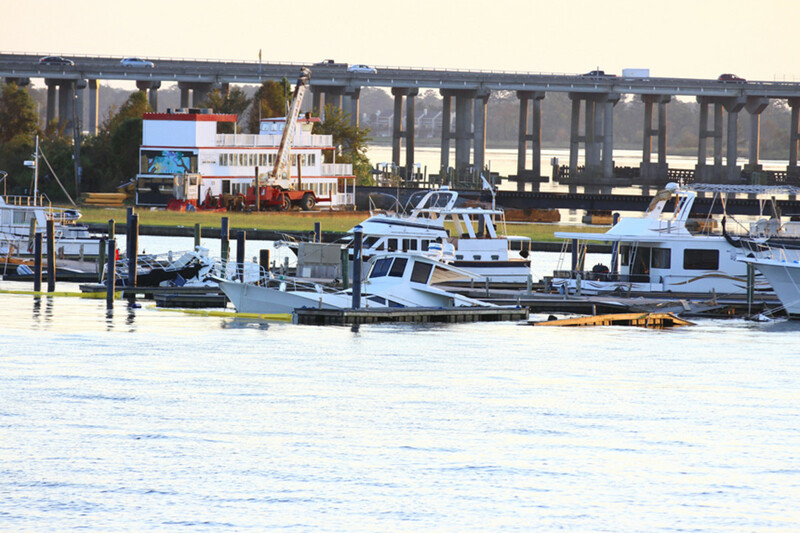 Marina management heeded the forecast and hauled all the boats in advance of the storm. The actual hurricane was a non-event for the marina, he says. But as of Sept. 27, the Waccamaw River had receded only to 20.9 feet and wasn’t expected to drop below the previous record until Oct. 2, according to Blankenship. 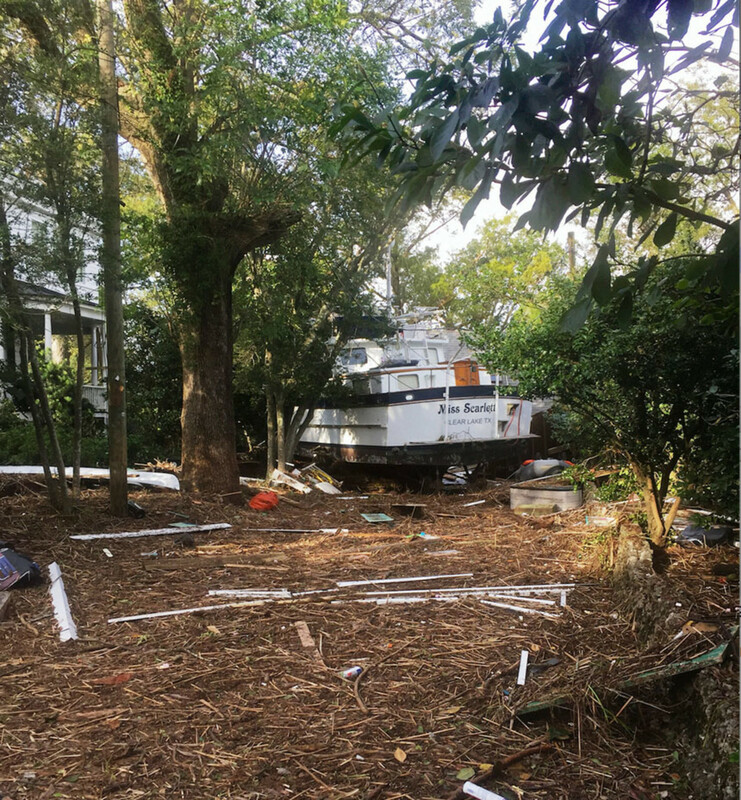 The situation that Keelan faced is one that marina operators and others must consider in terms of storm preparedness as weather experts continue to predict an increase in slower, wetter hurricanes. This trawler wound up in an unlikely resting spot. It used to be rare for people to expect a hurricane’s effects to last weeks after it hits. For a few days, there are uprooted trees and television news reporters in foul-weather gear, bracing against the gusts. The news typically gets quiet after a couple of days. Needham lived in Galveston, Texas, when Hurricane Harvey hit last year and flooded Houston with 40 inches of rain. The worst damage was done during days when the storm parked over the Gulf of Mexico, strengthened and dumped rain multiple times in the same area. Florence was similar. As forecasters predicted, the storm slowed when it made landfall, at one point moving just 2 mph. Rain fell for days and caused additional flooding. “Every season, we’re seeing one of these events,” Needham says. In 2012, Hurricane Isaac flooded areas that came through Katrina fine in 2005 because Isaac stalled around New Orleans. In 2015, Joaquin slowed and flooded South Carolina. The following year, an unnamed, slow-moving deluge caused flooding in Baton Rouge, La., and last year, Harvey dropped record rains on Houston. August 2018 was the warmest eighth month of year on record. Kunkel says the Gulf of Mexico and Atlantic were both 4 to 5 degrees above normal during Harvey and Florence, respectively. He estimates that those numbers mean there’s about 10 to 15 percent more water vapor in the air over the ocean, providing more fuel for hurricanes. “Once Florence formed and by chance moved across that warm water, it fueled the system,” Kunkel says. Flooding in Moorehead City, N.C., relocated this catamaran from its mooring. At Bridgeton Boatworks in New Bern, yard manager Mike Webber says high water caused the worst damage. The Neuse River had a 10-foot storm surge, and then Florence dumped as much as 30 inches of rain. Webber says the marina had a number of boats float off stands, including a 48-foot Tollycraft that took bricks off the local Marriott hotel before it came to rest. He estimated that the marina had damage to about 25 or 30 boats, most of which occurred when they floated off their stands. Webber, who is 52, says he has never seen that much water from a storm. He’s been in the New Bern area his entire life and owns a house in town. It flooded during Hurricane Hazel in 1954. When it was rebuilt, it was raised and had never flooded again until Florence. Like many locals who stayed, he feared that if he left and the roads flooded, he wouldn’t be able to get back in time to deal with the damage. “People realized they didn’t have any place to run and hide without being gone a week or two, and they wouldn’t be able to get home,” he says. As it turned out, streets in Ogdon were impassable, so Johnson’s reasoning was sound, though he might have questioned himself when there were several tornado warnings Saturday night. “Everybody would be in a closet listening, and when the eye wall came over us, it seemed like it carved a path for these little tornadoes that popped up,” he says. 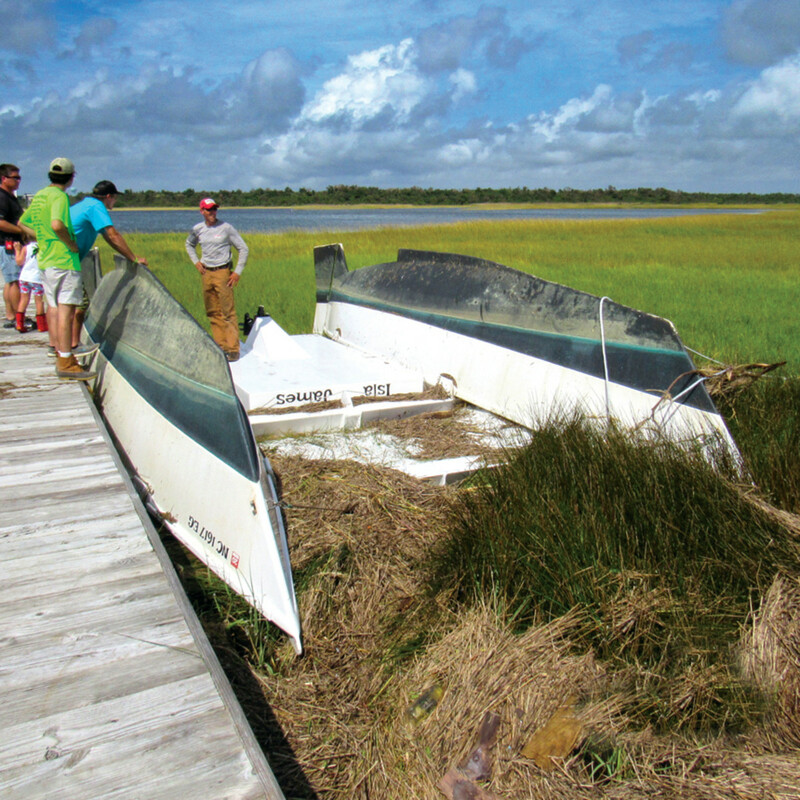 Bennett Brothers Yachts in Wilmington had minor damage. The company is on a high spot, 20 feet above the river. “We had another 10 feet of leeway before the river would’ve flooded our facility,” says Connor Bennett, company vice president.